Sometimes you just know something is missing in your instructional day. I moved to a new state last year, so I am still adjusting to the new district's curriculum. We have a great math curriculum, but I couldn't shake the feeling that something was missing. Then it hit me. 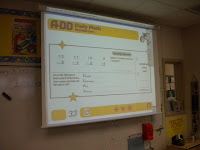 I remembered a program we did in my last district called Arithmetic Developed Daily (ADD Math). It only takes 5-7 minutes a day...it's a warm up. I didn't realize how good it really was until I no longer had it. the Grow Publications website. I was floored. I had no idea about all the other products they offer. Now that ADD math is running smoothly in my classroom, I have to share what I found. My former district purchased the teachers manual with black line masters and made student booklets from that every year. It worked great. However, I found an even better resource...they have it all on a CD! You can print out the individual pages AND present it on the Smartboard or other interactive whiteboard. My students almost levitated when they saw it. Believe me, you haven't lived until you've seen second graders levitate! We don't have a Smartboard, so I put it on the computer and projected it onto the screen...they still loved it. Here's what we do. I print out the copies ahead of time. Three lessons fit on one 8.5 x 11 paper. When students arrive in the morning, the copy is on their desk for them to complete. Once students finish it, they glue the copy into their math journal and join me for a quick review. I want to point out here that you can purchase small ADD math student booklets (which I will be doing next year) if you don't want to print out sheets. ADD Math spirals content. It is important to go back and touch on things periodically to ensure transfer into long-term memory. That is what I see with ADD math. Lessons include a skill review, a word problem of the day, math talk, concept corners, "Think About It!, and daily mental math. 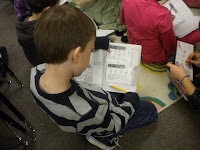 Grade levels 3 and above even have quizzes included. I like that the lessons include both basic math concepts and encourage deeper thought. They have the same products available for science, reading, writing, and social studies. I'm going to try the science next and I'll post how that works out. After that I'm sure I will venture into the other subject areas as well. From what I have seen so far, these are excellent daily warm ups with a brain-based spiraling approach. I can't wait to share more! This was really interesting to me. I think that ADD Math is a good idea and I would look forward to implementing that into my classroom lesson plans when I become a teacher. It's good to stimulate a child's mind in the morning with quick math lessons to get the day started. I just read through your last post. I see you're so interesting in learning and brain-engaging strategies. Sounds great. I teach English and train teachers of English. One strong point concerning learning your (my second) marvelous language. I love teaching and teaching English. Sorry for the mess. I was saying that a strong point for learning English is fostering learning strategies. This is a core point of my teaching and my students' learning. My congrats for your blog. I've got some friends that live in Dallas, Austin and Houston. I love US. I am all for having students work on some type of warm-up activity. Looking at the ADD website, it seems as though the manual is a great resource for these warm-up questions. The site also has the manual and BL masters at a very reasonable price, which makes me more inclined to actually pay the money for them! Since there is a CD available, it makes it that much more attractive, as well. Thanks for this wonderful resource!